Back on July 27 I wore the above outfit to work and the Alpina Geneve watch launch event after. It was one of those rare summer days in NYC when it's actually comfortable to wear layers. So needing to look the style part, I donned my favorite Madewell '37s jeans (which they discontinued :-|), a sheer shoulder cut-out tie-neck blouse, a vintage beaded jacket from my collection, and a pair of Delman peep-toe sandals. The look was quite a success, if I don't say so myself, but I also received approval from a few kids I met at the event. So imagine my surprise when I peeped the August cover of InStyle a week later! 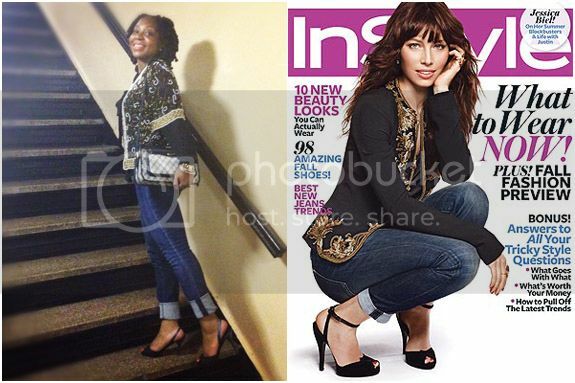 Jessica Biel was wearing a look very similar to mine -- right down to the cuff in our jeans. Of course, I realize that InStyle had to have shot the cover before July 27 -- I know how things work in the mag industry -- but it's also pretty cool to get sartorial approval from a national magazine that interprets fashion for everyday women of all ages.